Teychenne, Ball, and Salmon (2008) conducted a systematic review on depression and sedentary behavior in adults. Seven observational (5 cross-sectional and 2 longitudinal) and four intervention studies were included. Several studies have investigated the effects on cardiometabolic biomarkers of short episodes (2- to 9-hr, single-day experiment) of prolonged uninterrupted sitting versus various manipulations of reduced sitting during the postprandial period. In addition to the relationships with overweight and obesity, there is mounting evidence that screen time is associated with other cardiometabolic risk factors such as hypertension, high cholesterol levels, insulin resistance and type 2 diabetes mellitus, and metabolic syndrome (Council on Communications and Media 2011). Editors Weimo Zhu and Neville Owen have assembled a highly respected team of international contributors. Together, they provide an interdisciplinary review of current research, examining scientific, public health, and broader social questions about the implications of sedentary behavior. These topics include humans’ physiological predispositions, exacerbation of current health conditions like obesity and diabetes, and the design and ergonomics of offices and chairs. “Sedentary Behavior Concepts and Context” reviews the physiology of sedentary behavior, investigating current habits from the perspectives of evolution, industrial engineering, and design. “Sedentary Behavior and Health” explores the relationship between sedentary behavior and several major chronic diseases, including obesity, cardiovascular disease, and low-back pain. “Measuring and Analyzing Sedentary Behavior” explains research methods for understanding and measuring sedentary behavior in order to recognize patterns and design interventions. 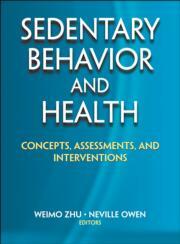 “Sedentary Behavior and Subpopulations” covers issues, risks, and behaviors in groups such as children, working adults, older adults, and minorities. “Changing Sedentary Behavior” provides methods and recommendations for improvement with environmental, social, community, worksite, and technology-based interventions. Epilogue: Where to Go From Here?